The Designer Grab by Moen is very unique, functional, and coordinates well with the most fixtures that are often found in many bathrooms. 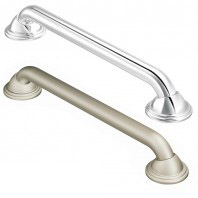 This grab bar meets ADA standards and is available in several lengths. The Designer Grab is a wonderful addition to any bathroom. The Home Care by Moen Designer Grab is designed to help you keep your balance when you use the shower or the tub. Made from stainless steel , this bathroom grab bar gives you a firm grip to easily hold.